Cabbage is great for B vitamins like folate, vitamin B1 (thiamin), B5 (pyridoxine), and B6 (pantothenic acid) that are essential for energy. Antioxidants such as Vitamins A and C and phytonutrients like thiocyantes, zeaxanthin, lutein, isothiocyanates, and sulforaphane are abundant in cabbage, and have the ability to stimulate detoxifying enzymes that may protect against breast, colon, and prostate cancers. And off course this cabbage salad is gluten free, dairy free, soy free, low glycemic, tastes great and is good for you and super easy & quick to prepare. Who could ask for more?! This can be a side salad or you can add a serving of chicken to make this a meal. For my plant-based peeps add a serving of beans, bean noodles, or eat with a Veggie Burger to make this a great meal. 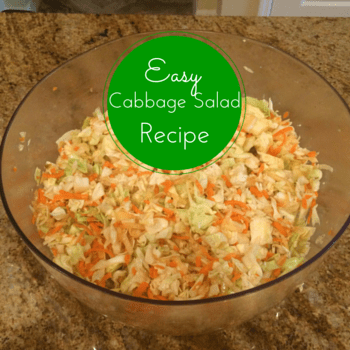 If you enjoyed this Cabbage Salad Recipe, I would greatly appreciate it if you commented below and shared on Facebook & Twitter.